Diana Fahl, Staff Council president, Interim Vice Chancellor for Academic Affairs Mary Blakefield and Chancellor Kathryn Cruz-Uribe present the Staff Council Service Award to Roger Cowan. Indiana University East recognized several faculty and staff during the Honors Convocation ceremony held April 28. 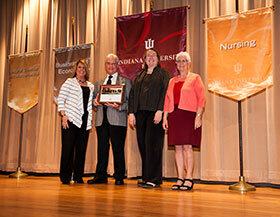 Presented during the ceremony were the Trustee IU East Faculty Recognition awards and Staff Service Recognition awards.